MOOSE JAW, Sask. — Farmers in California’s San Joaquin valley, devastated by drought since 2011, are changing the way they irrigate to maximize efficiency, says a former resident. Rae Westersund worked in California for Crop Production Services through the drought until a year ago. She is now with the company’s Loveland Products in Alberta. She shared her personal experience and observations at the Sask-atchewan Irrigation Projects Association’s annual conference in December. Exceptional drought now covers 44 percent of the valley, which is home to 80 percent of California agriculture, she said. “The only upside is that in 2014 exceptional drought covered 55 percent of the land,” she said. Westersund said it’s not difficult to see the impact of drought on the landscape. For example, the valley has sunk nearly 45 centimetres in eight months because of ground water extraction. A crop like alfalfa needs 5.2 million acre feet of water, she said. An acre-foot is the amount need to cover one acre to a depth of one foot, or 30 centimetres. It’s equal to about 326,000 gallons. Alfalfa would produce revenue of only $175 per acre. Corn, rice and other row crops are also less profitable than crops such as almonds, which return $1,300 per acre. Row crop acres are down 22 percent, Westersund said. The dairy and livestock sectors are finding that change hard to handle. Seventy-five percent of California’s dairies are in the valley, and the region is the top dairy producer in the United States. Westersund said milk production losses are estimated at 500,000 pounds per month, and the cost of feed is up sharply. Alfalfa is $215 per ton. “(University of California at) Davis estimates that $350 million is lost primarily in the dairy industry,” Westersund said. Instead, farmers are moving to vineyards, pistachios, almonds, hazelnuts and orchards. Even older almonds aren’t immune to the change. Almond stands aged five to 12 years generally produce the best. Growers are pulling out older stands and using their water elsewhere, or planting almonds even though it will be years until they get a return. Westersund said growers expect much higher per acre returns than prairie farmers and aren’t equipped to wait out a drought. Some are selling their water rights. She cited one farmer who has 900 acres northwest of Sacramento and usually grows rice at a return of $900 per acre. “He is currently selling his water rights at $700 per acre foot,” she said. “The last time water rights were sold was in 2010 at $250 per acre foot. Westersund said wells that are typically 400 feet deep are going dry in 18 months. Farmers are now drilling deeper in an attempt to find water. It takes time and lots of money with no guarantees. She said there has been an increase in micro and drip irrigation because growers still need to produce and have had to become more efficient water users. 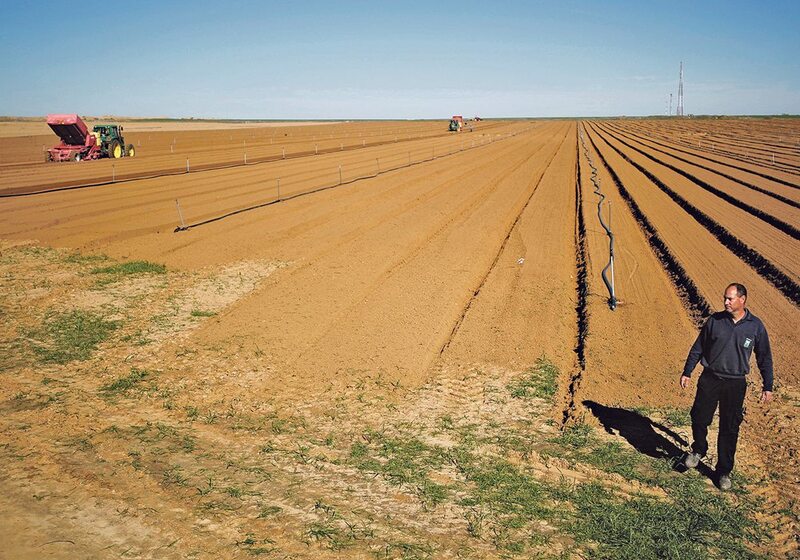 Drip irrigation use is up 80 percent since 2010 and is now the most common. Pressurized tubing is set in between crop rows and fitted with nozzles that allow the water to drip out. Micro irrigation is a system of applying water more often but at specific locations, typically the root zone. Westersund said growers are managing their drip systems this way. “We have 30 percent water savings versus using a pivot irrigation system and 50 percent savings versus a flood system,” she said. Farmers who irrigate are also using products such as CPS’s Water Maxx, a surfactant applied with the water that helps it spread horizontally and percolate through the soil rather than pool on top. Agronomists are working with growers to check soil moisture conditions and soil needs and develop plans for the most efficient irrigation. Westersund said gross farm income in the valley has actually increased because growers are planting higher value crops. However, net farm income has dropped because production costs have increased. They also have to contend with wildlife digging up and damaging irrigation systems to find water.